First day CAG- PB mirror!!!!!!!!!!! Welllllllll, that didn't last long!...Just caught my new PB grass carp!- 46lb 13oz and 48" long!!! 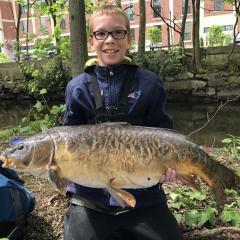 !.....Not what I was fishing for, and a very rough day-lost my first carp to a snag, as well as the hair rig, lost an entire rig to another snag, then caught 4 straight channel cats, then a little, pretty, 5-5....switched locations and caught a 12-7, then this massive beast!!! !.....Kinda makes up for the day!.. Hi all! Plugging along catchin, though no hot action yet (6 carp in 2 hours), including this personal best 33lb 6 oz runner!!! ....beat my previous of 25lbs!...Nice, but wantin a common that big!!! !...good luck all!!! I just made contact with a fellow who fly fishes for carp here in Tennessee. We are planning on getting together this year to put some gold in the net by using the skinny stick. Stand by for photos and all the details! Prepping for the FFF, and carpin in general, I was continually frustrated driving to a swim, going through the woods, etc. and getting my rods tangled; whether in the car or walking to the swim...........I don't like putting my hooks off my method feeders to the hook holders, or line guides on the rods-it damages the hook point, bends the shrink tubing and puts pressure on the line at the rod tip-sooooooooo, I tried a simple, simple thought-I looked for little nylon bags to cover the hooks, but after not finding any, I used zip-lock sandwich bags-simply placed my method feeder/hair rig in the bag and zip-lock....no tangles, no hooked on brush, etc.!! !......worked well hauling gear for the FFF!! Hi all!!! To echo Frank's call to participate in the 2018 FFF, I took the liberty to perform a pre- FFF primer, last night to show how easy it is!..........so........here's a simple step-by step process; 1. Wake/Stay up 2. Check the local time (starts at midnight!) 3. Drink (insert here- victory coffee, tea, juice, water, etc, but don't drink and drive) 4. Dress appropriately 5. Proceed to the local carp venue which contains un-frozen (non-frozen for the North zone anglers ) with appropriate carp fishing gear- pole, reel, line, hook, bait 6. Proceed to insert line/bait into carp venue 7. Reel in carp 8. 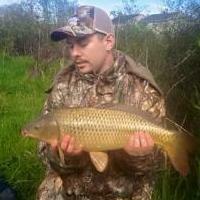 Obtain photo of you and carp, preferably a time stamp on your picture 9. Release carp 10. Rebait and fish; repeat steps 6-9 over and over until 11:59pm January 2nd 11. Record and send in your photos on the thread Frank has set up ( thanks Frank and CAG for having this!!) 12. Follow these modified steps 1. Thank your uber drivers 2. Dress appropriately for a good nights sleep 3. Drink (see above) 4. Check the local time 5. Fall asleep By following this simple 17 steps on January 1st 2018, you too will enjoy the comaraderie of fellow CAG members as we start off what will be the best carpin year of all!! I followed these steps exactly, and low and behold.......... I was already awake. The local time was 11:40pm December 2, 2017. I drank one swig of tea. I dressed appropriately. (these I found were all easy steps) I proceeded (with the assistance of fellow CAG member and wife) to be dropped off at my venue....(it isn't safe to leave the car there). The water was un-frozen. I proceeded to place my terminal tackle into the water. I caught carp at 11:50pm 4-4lbr; 12:10am 3-0lbr; 12:21am 3lb 4oz, and this 4lb 8oz at 1:00am-thats my BIG FOUR FFF fish. Then I enlisted the local uber driver (my son and fellow CAG member) to retrieve me from the venue. I followed the modified steps and was asleep by 2:00am and now back to work at 6:00am..........good luck all!! !....be safe... ( I really don't look like skeletor ,,,ummmm, wellll.......)...thanks all!